Make your own Valentines Cards this year! 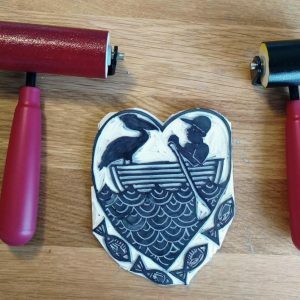 The Studios of Cocoa Beach, 165 Minuteman Causeway in downtown Cocoa Beach, is hosting an introductory linoleum block printing class on February 4 and repeated on February 11, 2019 from 10 am to 1 pm. Pick either Monday for this fun workshop where you will learn to transfer your design to a 4 x 6 inch linoleum block. Tiana O’Kontek will teach you creative cutting and inking techniques and you will leave with a limited edition of your very own Valentine cards. Cost of the two day class is $50 with a $25 non-refundable deposit due on January 28. Call 520-971-6911 or email Tiana at tigerkeypress@gmail.com to register. All materials are supplied but bring in a drawing or image that you’s like to use on your card. Tiana O’Konek is an artist/lawyer/activist/wife/mother/dog owner currently specializing in woodcut and linocut prints. She draws inspiration from the world around her as well as from interaction with chisels and wood.